A data-heavy project I’ve been working intensely on the last week or so was released yesterday. 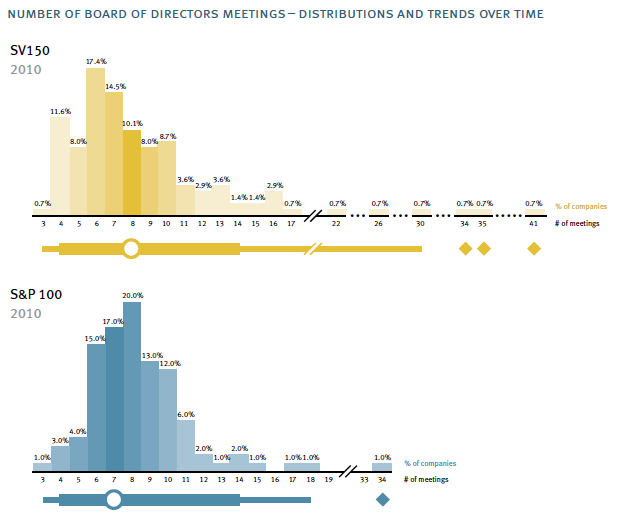 It’s a statistical review of corporate governance practices since Sarbanes-Oxley, done by the law firm Fenwick & West. Is it strange that I love graphs so much? Thanks to my nephew Christopher for bringing this infographic to my attention. 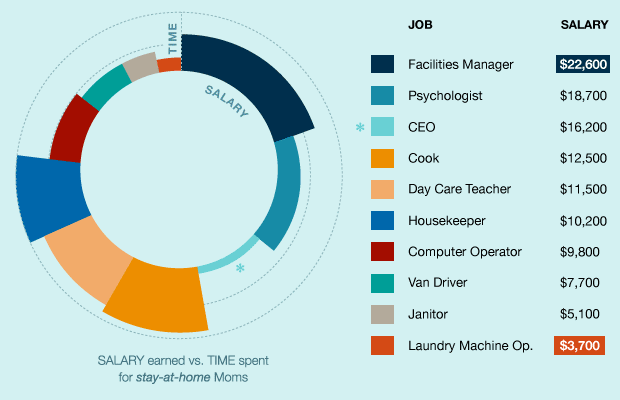 According to the calculations done by the creators of the graphic (degreesearch.org), a stay-at-home mom should be paid $115,432 for her troubles, including 56.6 hours of overtime. Still a gross underestimation of the value of a full-time mother. I like the inventive use of the circular graphic to show salary earned vs. time spent, though I needed the accompanying tables to help me figure out what was going on. Like most good infographics, this one starts with a compelling idea and interesting data. That was enough to make me want to spend the time to understand it. I’ve only shown part of it here. It’s worth clicking through to see the whole thing. That’s the tagline for a new website examining statistical indicators of how life in the U.S. has changed over the last few decades: startlingstats.com. Threestory Studio created all the graphics and designed the site. The aim of the site is to wake people up and promote dialogue about life “as we know it”. I use quotes there because who is “we” and what do “we” really know are all part of the debate. I hope you’ll take a look at the site and leave a comment or two. I’ve found Sir Ken Robinson’s addresses to be captivating and inspiring since I first was directed to one on TED a year or two ago. 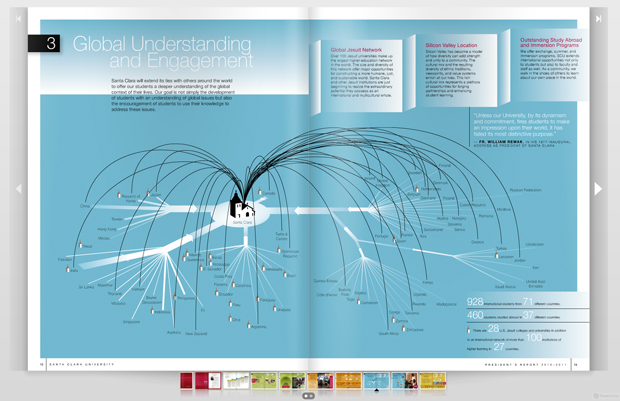 RSA’s animated illustration of one of Sir Ken’s discourses brings a visual dimension to some important ideas. Makes the ideas even more sticky, for me at least. I’m working on a project aimed at illustrating dramatic changes in the way we live now compared to the not-so-distant past. One startling statistic is the change in outstanding consumer credit in the United States. That’s the amount of money people owe on credit cards, car payments, etc. (not counting home mortgages – that’s another story). Here’s one attempt to illustrate the change over the past 30 years. I don’t think it’s getting the point across. The gut reaction seems to be excitement that she gets to take home so much stuff. I acknowledge that representing debt with shopping bags is a step removed from most people’s perceptions. But if they were more closely connected in our minds (shopping and the cost of buying on credit), maybe we’d be healthier consumers. The truth is, debt is a crippling burden for many in America today. Maybe she needs to be crawling in tattered clothes, dragging the heavy bags along behind her. Uphill. In the snow. Back to the drawing board. You are currently browsing the archives for the Data Illustration category.